Well done to all our GJOs who’ve been putting in the hours training prior to Summer Series events recently before traveling down to compete in this year’s Jamie Stevenson Trophy at Balkello near Dundee last weekend. 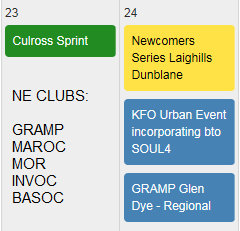 14 clubs attended from all over Scotland and ran Yellow, Orange, Light Green and Green courses with a points system based on finish places for both boys and girls classes so to maximise your team points potential you need a wide range of age and both boys and girls spread over the courses. Not easy to cover all bases if you have a relatively small team but the GJOs gave it their best shots and we came 8th out of the 14 clubs with a stonking 534 points. Our top runners were Maya Reynard, Connor Whitelaw, Josie Gomersall, Paul Caffyn, Morvern Farquharson and Kirsty Farquharson – congratulations guys! Full results can be found here. Congratulations to our arch-rivals, Maroc, who retained the trophy. Paul also posted the fastest run in time of 16 seconds and it looks to be about 125m on RouteGadget giving him a ballpark running speed of 28.1km/h. Woohoo! The whole thing was all kicked off with an opening ceremony and parade as usual but I’m told the team weren’t impressed by the new white banner and had hoped for the BIG RED one? Next year.